Never heard of Corebird? It’s a native GTK+ Twitter client for Linux which has a modern and responsive design that looks kinda similar to the official Twitter app for Mac. Corebird is a free and open source project created by Timm Bäder, AKA “baedert”. It carries the whole essential twitter features, such as Streaming of Tweets, Mentions/Notifications, Favorites, Direct Messaging, Lists, Filters and an integrated search. With the advantage of the latest GTK+3 features, the application makes use of the new Header Bars. 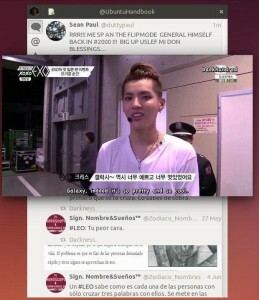 With the gstreamer and gstreamer plugins, corebird allows to view any videos (i.e. no vines and no twitter gifs). 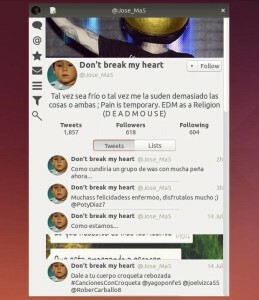 The application is well intergrated with with GNOME Desktop. 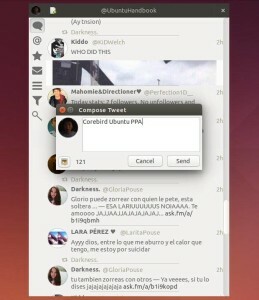 It supports GNOME Shell Application Menu and displays the number of Twitter notifications on the lockscreen. I’ve successfully built this twitter client into my PPA, available for Ubuntu 14.10 and Ubuntu 14.04. 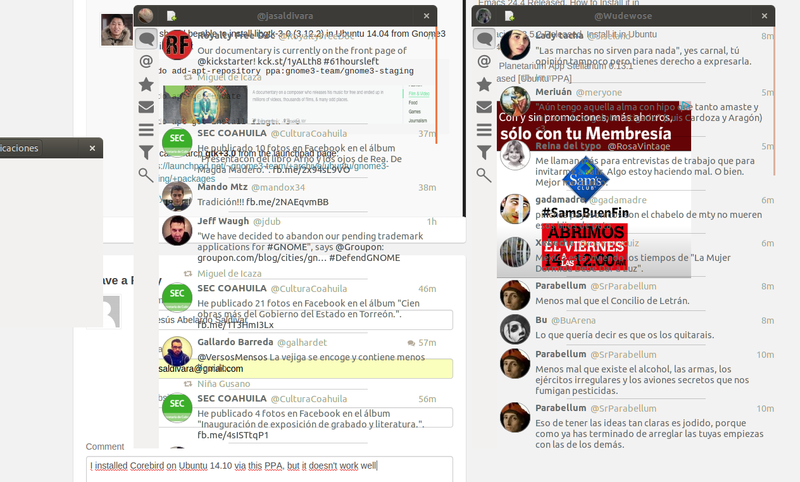 Corebird depends on gtk+3 (>= 3.12), so Ubuntu 14.04 user need to add GNOME3 and GNOME3 Staging PPA. As the Staging PPA is for test use, it might break your system, use it at your own risk!! Or grab the .deb package directly from HERE. Sorry, the Ubuntu 14.04 build in the PPA is based on the Gnome 3, and Gnome 3 Staging PPA. It works on my 14.04 64-bit laptop, but not tested in Mint. I installed Corebird on Ubuntu 14.10 via this PPA, but it doesn’t work well: Timeline windows have transparent background, so I can’t read. hello Ji m first thank u for all ur info but i want ask u i have ubuntu 14.04 64bit using unity desktop so how can install corebird and corebird need gnome 3 ? should be change desktop from unity to gnome or no ? Corebird depends on some gnome 3 libraries, but you don’t need to install the Gnome3 Desktop, though it looks better in gnome-shell. Again corebird needs the Gnome3 Staging PPA for the higher GTK version for Ubuntu 14.04. But the PPA is not stable for use, use it at your own risk! Ubuntu 15.10 (or Ubuntu 15.04 with gnome PPA) is required. Please remove those dependency PPAs after because they contain unstable packages that may break you system.